Sisters of Frida is a member of ROFA (Reclaiming Our Futures Alliance). In times of austerity, we see disabled and older women are likely to be coerced into assisted suicide from different pressures. If the Assisted Dying Bill is passed, some Disabled and terminally ill people’s lives will be ended without their consent, through mistakes, subtle pressure and abuse. No safeguards have ever been enacted or proposed that can prevent this outcome – an outcome which can never be undone. Maud lives round the corner from me in south London. She is 90 and on her own. She remembers a time when everyone knew everyone else, and when there was genuine community solidarity. Nowadays people come and go, she says, and young people can’t be bothered with the elderly. She is often lonely. “Even the doctor came round to see me and asked me if I wanted to commit suicide,” she says. With two Assisted Dying bills currently before parliament, it is really important that Deaf and Disabled people and our organisations speak out loudly against the legalisation of assisted suicide and raise awareness of the threat this poses to disability equality. Our message is that we want support to live not die. At a time when essential support is being taken away from us, when the challenges we face are exponentially growing as a direct result of adverse government policy, it is more dangerous than ever to introduce legislation which encourages suicide as a solution to the barriers Disabled people face. 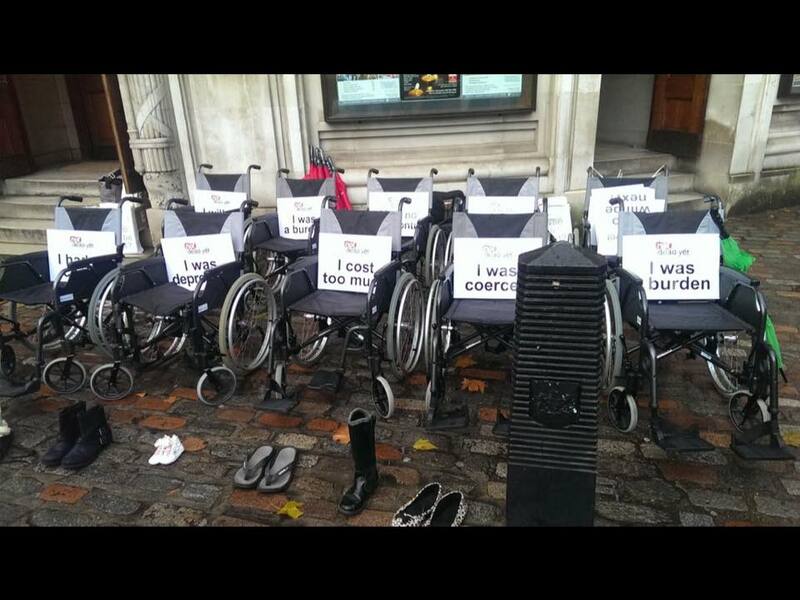 We say: give Disabled people a right to independent living before a right to suicide. Below are different ways that Disabled campaigners and our supporters can take action and get involved. We realise that not everyone has the time to do everything but anything you are able to contribute to the campaign would be valued. 1) Sign up the Reclaiming Our Futures statement. It’s quick and easy to do: just email your name to [email protected] with ‘AS statement’ in the subject line. We are asking organisations, campaigns and individuals to sign up before the end of August. It’s really important we can show there is wide support for the case against legalisation. We are opposed to legalisation of assisted suicide. It will remove equality and choice from disabled people and further contribute to our oppression. If the Assisted Dying Bill is passed, some Disabled and terminally ill people’s lives will be ended without their consent, through mistakes, subtle pressure and abuse. No safeguards have ever been enacted or proposed that can prevent this outcome – an outcome which can never be undone. 2) Write to or arrange to meet your local MP (even over the Summer they will be receiving and responding to mail). You can download a template letter here. Some MPs are organising public meetings to canvass the views of their constituents – check their websites to see if your MP is one of these. Please send us copies of any responses you receive. 3) Help publicise the facts about assisted suicide, for example send a letter to your local paper. Download the Assisted Suicide Open Template Letter for Media here. 4) If you have a personal story about this subject which informs your view on it and which you are willing to share please let us know. We are also looking for Disabled people who are happy to speak to the media about why we oppose legalisation of assisted suicide. 5) Join us at the Not Dead Yet UK/DPAC Protest on 11th September. Gather outside Parliament to show our opposition to Marris’ bill while it is being debated inside. Meet Old Palace Yard (opposite the House of Lord’s) from 9am. Further details to be confirmed.